If you're searching for a vegan trifold wallet made of faux leather or other man-made materials, then you've come to the right place. We've managed to round up 10 of the best-looking and most functional options on the market today. 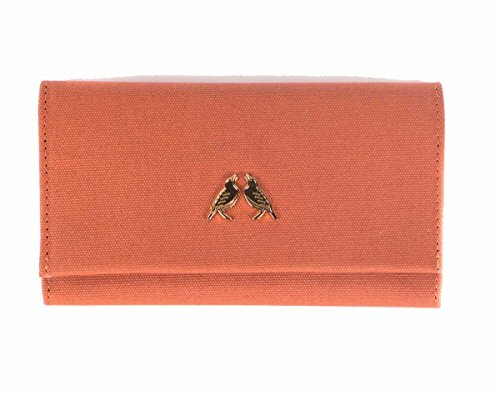 Two gold sparrows embellish this lovely vegan trifold wallet for women. Made of durable, water-resistant waxed canvas in a soft sherbert color. 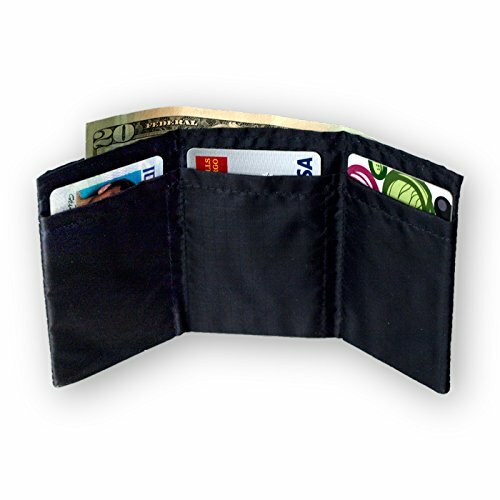 Constructed with 12 card slots and five pockets, including a cash and cellphone pocket. Closes with metal snap buttons. Pros: It's beautifully designed and crafted with care. Waxed canvas is a highly resilient material that repels water droplets, making this wallet practical for use anytime, anywhere in any weather. Cons: It's up there in price. Made of strong nylon fabric with faux leather trim, this wallet for men offers RFID protection against data theft. Constructed with a clear ID window, 3 card slots, two slip pockets and a bill compartment. Flexible with an extra expandable hard holder. Pros: Because of its elastic material, this wallet should be accommodating without running the risk of permanently stretching out. The design is sensible, making up for its few card slots with an extra card holder. Cons: The Velcro closure could wear out. It's also not the quietest material. This ladies' vegan trifold wallet in burgundy features whip stitch accents on luxurious pebbled faux leather. Constructed with inner and outer zip and slip pockets, seven card slots and an ID window. Pros: The whip stitch embellishments add a classic feel to this contemporary wallet. With inner and outer zip pockets, there are plenty of places for coins, travel tickets and anything else you need quick access to. The Armstrong wallet is made of vegan micro leather that's soft and smooth to the touch. Comes with a full-length bill compartment, four card slots and an ID window. Made with a slim design. Pros: If other faux leather wallets you've had have been short-lived, try The Vegan Collection wallets. Made with high-quality materials, they're made to last. 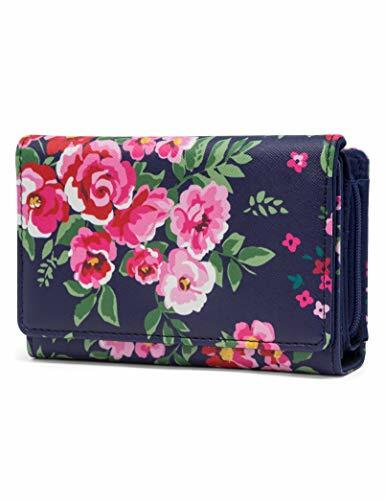 A lively floral pattern gives this navy blue faux leather wallet a playful feel. Spacious with 16 card slots, a full-length cash compartment, a zip coin pocket and an ID window. Pros: This is the wallet for you if your wallets tend to be overflowing with credit cards and coffee punch cards. It's also on the smaller side, saving space in your bag. Cons: It could easily get bulky as you fill it. Need a super slim wallet? 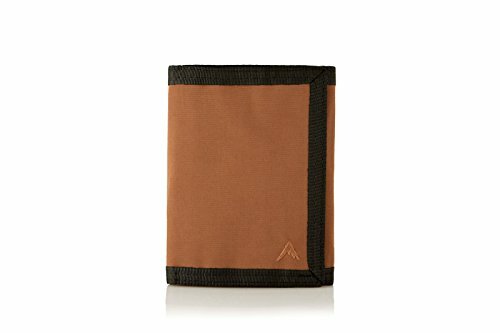 According to the Amazon vendor, this minimalist wallet for men is up to 75 percent thinner than the average wallet. Made of long-lasting ripstop nylon. Designed with three card slots that can carry 12 cards. 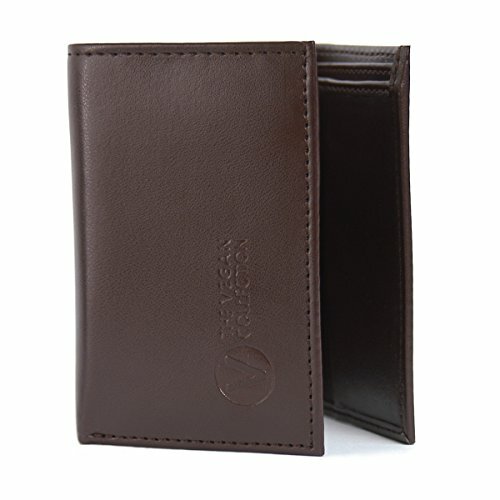 Pros: A slender wallet like this is perfect for slim pants and clothing made of light or thin material. Since it's so durable, it should hold up for the active individual. Cons: Some reviewers caution against stacking up cards in the slip pockets as they may become loose. The Mondo Spender is bold and bright in a watercolor-style geometric pattern. Made with a pen holder, an outer zip pocket and cash, checkbook and card pockets. Pros: It's generously sized with plenty of room for all the necessities. With an outer zip pocket, you can reach your change quickly and easily. Cons: It's not a small wallet, so you might need to carry a bigger purse to use it. 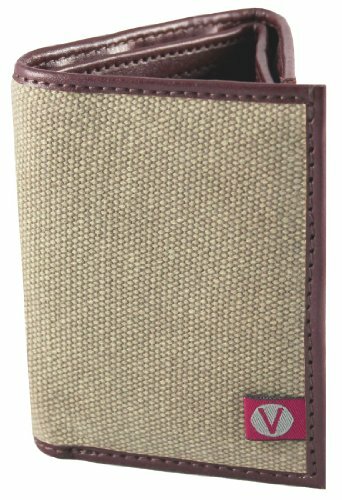 Trimmed in dark brown faux leather, this beige canvas wallet from The Vegan Collection is casual yet refined. Comes with a clear ID window, four card pockets, two extra slip pockets and a bill compartment. Lined in vegan micro leather inside. Pros: The extra slip pockets ensure that you can travel light or pack a few extras when necessary. It's nice and slim, perfect for any attire. Cons: Some reviewers would like to see more card slots. 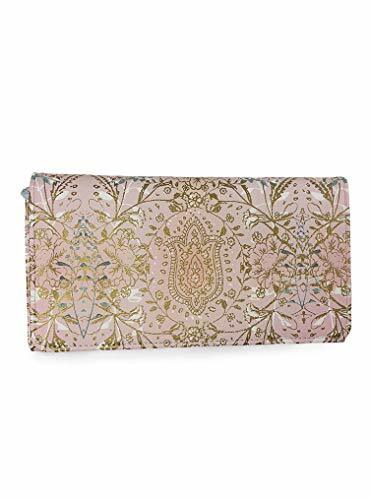 Gorgeous and grand, this ladies' wallet features an intricate lotus flower design in shimmery gold. Constructed with an ID window, nine card slots and a zip pouch. Closes easily with snap button fastening. Pros: Combining fashion and functionality, it's extremely well-organized inside with numerous places for checkbooks, cash, cards and coins. Cons: It's a little pricey. Simple but sturdy, this black nylon trifold wallet for men is water-resistant and practical with a zip coin pouch, an ID window and a 12-card carrying capacity. Advertised as vegan: No, but it's made with synthetic materials. Pros: Slim and sleek-looking, this wallet is versatile and international travel-friendly with a multi-currency system. Cons: It's edging toward the expensive range.